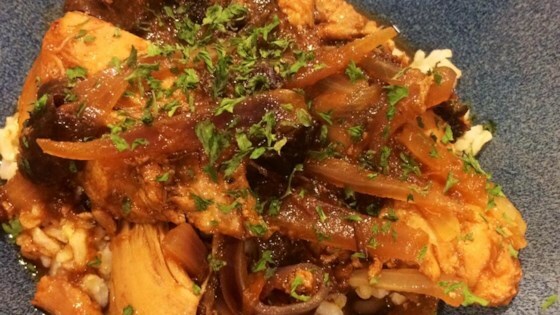 "This is a delectable chicken dish from Kozani, a city and region in northern Greece. The prunes and onion lend sweetness, while the paprika offers a smoky flavor. Serve with steamed rice." Place the chicken thighs and water into a saucepan. Bring to a boil over high heat, then reduce heat to medium-low, and simmer 10 to 15 minutes. Skim off any foam that floats to the surface. Meanwhile, heat the olive oil in a large skillet over low heat. Stir in the onions, and cook covered until soft and translucent, about 10 minutes. Do not let the onions brown. Add the chicken to the onions along with 3 cups of the cooking liquid. Stir in the prunes, paprika, bay leaves, salt, and pepper. Return to a simmer, cover, and cook until the prunes are tender and the flavors have combined, 15 to 25 minutes. See how to make a savory Greek-inspired chicken dish with prunes and paprika. This has become a new favorite in our house. it is easy and so delicious. I just let it cook much longer so all of the flavors meld and the prunes totally degrade. Yummy! very good! i used less onion and instead of bay leaves, fresh oregano. yum! This was delicious !!!. One thing I did change was the feta cheese. I did not have any !!! So.... I added blue cheese. The kabobs were as moist as could be. We loved them.